The series is a collaborative venture with Maureen Tracy Venti, a poet who splits her time between Key West and Jackson, New Hampshire. "In my work, I attempt to unite the viewer with the power of the sublime found in our visual environment. Whether a color-saturated twilight sky, the expression of a human face, or the exquisite sculptural quality of a piece of fruit, the inspiration for my paintings derives primarily from nature and emerges intuitively. 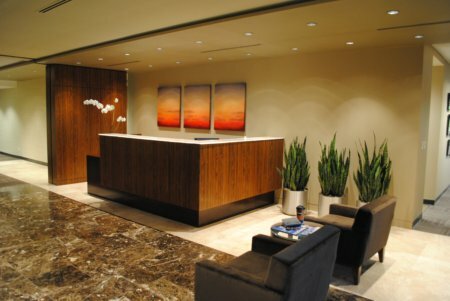 The work is meant to evoke elemental emotions and an aesthetic arrest universal to the human spirit. 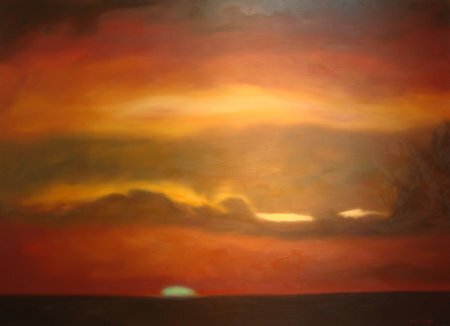 The SACRED SPACE dawn dusk paintings were the result of daily physical immersion into the energy and color of morning and evening twilight in Key West for a full year. The spiritual rejuvenation and transformation was personal and translated to my art. Over the course of the year, the paintings progressively grew in size and in their level of peace and unity. As I reconnected with the cycles and colors of nature, the resulting canvases became monumentally larger and compositionally quieter. 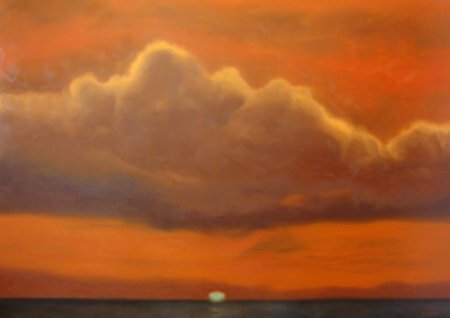 The paintings represent an attempt to channel and reduce to the essence my experience during those mornings and evenings spent alone with the enveloping beauty and boundless energy of the sky. As John Muir so eloquently stated, 'Going out, I found, was really going in'. Toward the end of my incredible year, I was fortunate to witness and photograph two elusive green flashes within a one-month period. A green flash is a one-to-two-second refraction of light phenomenon that rarely appears, just a moment after the sun sinks below the horizon." Please click on the SACRED SPACE dawn dusk link at the top of this homepage for ordering and pricing information for the paintings, the photographs, and the coffee table book. The 136-page book features 113 copyrighted photographs (including two green flashes), each also for sale on the website by title and page number in the book. 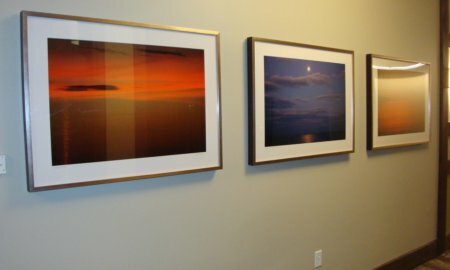 The photos are available framed or unframed, signed or unsigned, in varying sizes. Please follow the instructions on the site using Paypal or email keith@keithbland.com to order books, photos, and/or paintings. The SACRED SPACE dawn dusk work has been featured in three solo exhibitions. The first was held at The Studios of Key West (tskw.org), March 3 - 15, 2011. The second was hosted by the Memphis Botanic Garden, April 1 - 30, 2011, and the third at the galleries of Askew, Hargraves, Harcourt & Associates (A2H) in Lakeland, Tennessee. 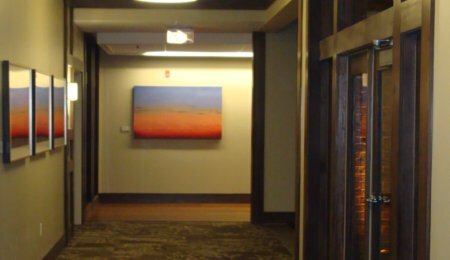 In addition, two of the large paintings and six framed photos have been featured at gala openings of Phase 1 of the new Methodist Hospice Residence facility in Memphis. 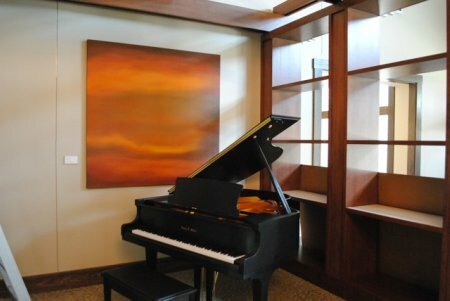 The pieces were chosen and purchased as part of the highly successful Methodist Le Bonheur Hospital's new focus on fine art in hospitals. 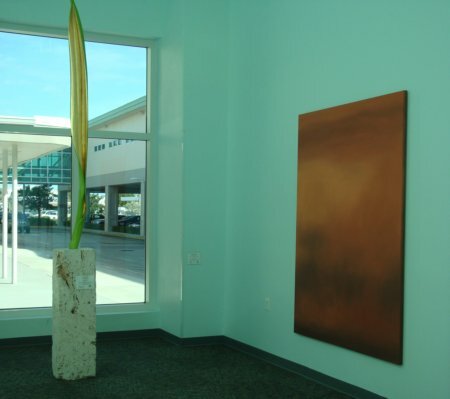 In January, 2012, the Florida Keys Council of the Arts selected three of the large paintings to hang in a very prominent location at the Key West International Airport (see below). 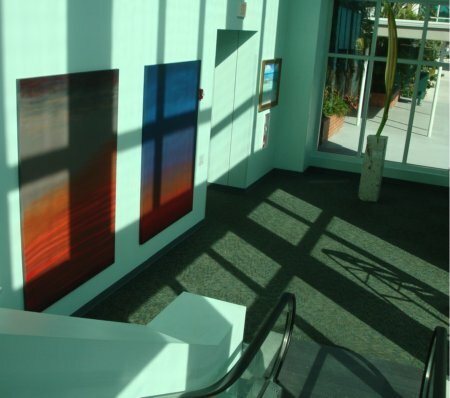 Three 7 feet x 5 feet paintings in oil hang in the Key West International Airport.